Yashar Moradbakhti, is the CEO of Lingio, a tiny but yet so cool startup founded in 2015 by friends working at Spotify with the ambition to reinvent language learning. Yashar has a creative technical background from companies such as EA Games, Spotify and MTGx - bringing that experience to language learning and making it more entertaining and fun. The past months the Lingio team has focused on becoming true social entrepreneurs and creating technology that really helps people in need. 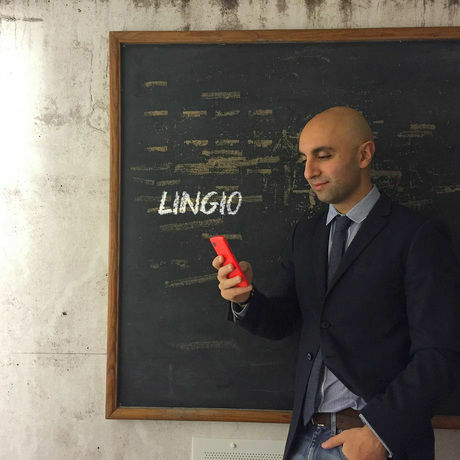 Today Lingio works with several volunteer organisations to provide them language tools that support them in their work with refugees so they can learn new languages and become more involved in society. Originally from Iran, Yashar came to Sweden at the age of 7 and quickly started loving the Swedish language and culture. He got his MSc. in Computer Science at Kungliga Tekniska Högskolan and although a globetrotter, Yashar has always come back to Stockholm - his favorite city!